It’s Day 4 of the Big Sell 30 Day Challenge! We’re inviting everyone to join us and attempt to experience something new in pop culture once a day for 30 days. Check back here every day for a new Big Sell! We’ll be alternating who is giving the Big Sell over the next few weeks as well as featuring Big Sells from some of our favorite fellow podcasters and listeners too! Today, we are excited to feature our first listener Big Sell! Soon after we announced #BigSell30, Mauricio Lima, one of our Twitter followers all the way from Sao Paolo, Brazil, tweeted his Big Sell to us! 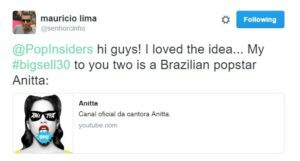 Mauricio’s Big Sell is the Brazilian pop star- Anitta. After doing a little research on this singer, songwriter and dancer, it turns out millions of people around the world have already seen her but may have no idea who she is. The stunning 23-year-old pop star performed at the Rio Olympics Opening Ceremony in August and one of her most popular songs, “Bang” has over 230 million views on YouTube! Want to be featured in a Big Sell 30 Day Challenge? Send us a pop culture suggestion! And also make sure to tell us how your #BigSell30 Challenge is going! Leave a comment here or tweet us @popinsiders. Thanks Mauricio! We are excited to check out your Big Sell and look forward to more from our listeners in the future.